The Changeling Press authors and staff share their favorites recipes! All recipes in this collection have been donated by Changeling Press authors, artists, and staff members as a fundraiser, proceeds to be donated directly to the Quiet Kitty Fund. Founded in 2006, www.SavetheQuietKitty.com is a not for profit organization dedicated to helping uninsured authors with medical needs. Many thanks to the team that worked so hard to bring this project together. "Too many cooks in the kitchen? Not so with this book. 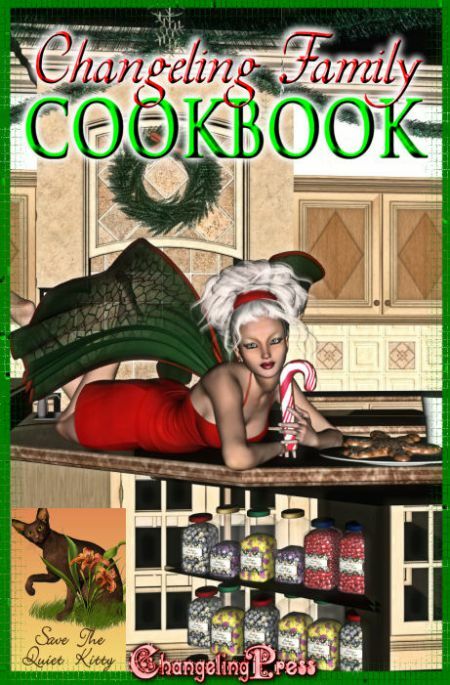 Get a copy for a great cause and enjoy the benefits in the kitchen and at the table!" In England, no Sunday Dinner is complete without a couple of Yorkshires. My brother routinely piles his plate high with them. My young cousin eats them with 'special gravy' -- AKA instant minestrone soup -- poured over. Best served as an accompaniment to a roast dinner, including plenty of roast potatoes and gravy; or you can bake them with sausages and make toad-in-the-hole, as below. Serves four (unless you're my brother, in which case it serves one). Preheat oven to 230°C (450°F). If you are making individual puddings, you'll need a cake/muffin tray. Pour some fat into each pan (this is not exact, use 3-4 tablespoons for each pudding and don't stint!). You can also make large puddings in a pan about 6-8" across. Mix the milk, water and egg together in a jug. Then sift the flour into a large bowl, and make a well in the middle. Pour a little of the liquid into the well, and stir it gradually, trying not to touch the sides: the movement of the liquid will bring the flour in and make the well bigger. Add the rest of the liquid a bit at a time until there's no more flour left, and you have a smooth batter. Put the baking pan into the oven without the batter in it. The fat needs to be hot before you start cooking the batter. If it starts to smoke, then take the pan out, and pour the batter in. Cook for 10-15 minutes, until the puddings have risen and are golden brown. Serve with a roast dinner of lamb, beef or chicken, with gravy, peas, roast potatoes and carrots. No, not a euphemism, but a very tasty alternative to the full roast dinner. Make Yorkshire batter as above. Cook half a dozen sausages in a deep-sided baking pan in the oven (use whatever kind of sausages you like -- this will dictate cooking time but usually around 20 minutes will do). When the sausages are lightly cooked, space them out evenly in the pan, pour the batter over, and cook for another 10-15 minutes. Serve with gravy.